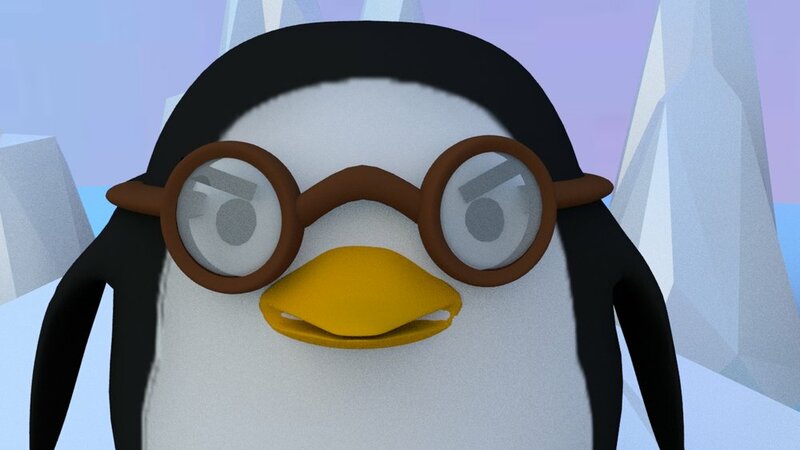 Still from first scene of When Penguins Fly (2018). Create a short 3D animation film using Maya Autodesk that employs animation principles, facial animation, texturing, and a variety of surface materials and shaders. In this school project, this was the team’s first experience using Maya, animating, and 3D modelling. Teams had open choice with what story they wanted to go with, and we chose a low-poly, comical idea as it was of most interest to each of us. Learning Maya was a program we had never used before, but over the course of the project and production pipeline I found myself growing much more comfortable and wanting to learn many more aspects of 3D animation and similar software. Direction of the story and setting was decided in order to be accessible to the team’s new education in 3D modelling and animation. Final character look and direction was decided to emphasize contrast between the penguin and bird, as the bird was tiny but wanted to help the penguin fly. We drew inspiration from a few places, including Pocoyo, Animal Crossing, and Netflix’s 3D Rilakkuma show. Creating an annotated and voiced storyboard allowed us to consider what was plausible with the time we had and what had to be cut out to not drag the overall narrative. Doing so also considerably helped final decisions in shot choice/shot movement for cameras in Maya Autodesk. The final story was discussed as the group but the storyboard and drawings were completed by myself. As I was responsible for the modelling of our main characters and rigging, I kept in mind the playful mood and direction of our short film as well as our inspirations. I began with polygon primitives and extruded faces in our characters, but also combined meshes of these primitives to keep their designs simple-looking. To prepare for the team’s next step in animation, I rigged the character in Maya, and painted the skin weights. Admittedly, painting the weights was one of the more complicated processes as parts of the weights kept having issues. However, I was able to produce a final, clean rigged character for the team to use in the later animations. Smoothed, wireframe, and rigged views of two main characters. The team separated the film into three parts so we could all learn how to animate and use camera movement. My assigned section is from 0:00-0:40, but due to some issues in Maya version capability, I unfortunately had to end up re-animating parts of my teammates scenes, such as 1:25 to the ending because I was doing the final rendering at my own home (please view final video below). Aside from animating the characters, I also keyframed facial animation to our characters eyes and eyebrows as a way to add more enthusiasm and interest to the film. This proved successful in the end as one can clearly tell what each character is feeling in the short film based on the eyebrow movements alone. Bird character showing pity to sad penguin. Penguin becomes determined to fly. Rendering was completed with Arnold Renderer in Maya on my home desktop, and took around 30 hours to complete all the frames. After, I compiled the frames in Adobe After Effects and then imported them to Adobe Premiere. From there, sound was then added by Sky and myself towards the final version of the animated film. Due to our film being a humorous 3D cartoon, we used freesound.org to assist us in getting our mood across with bouncy music and sound effects. Workspace view of final editing and post-production in Adobe Premiere Pro. We encountered a few compatibility issues between Maya 2016 and 2018, which caused a drag in the final days of production (skin weights, rigging, disappearing skins, and strange animation issues) which then had to be touched up on my personal version of Maya at home before proceeding with final rendering. More rendering time would have been optimal - everything was completed for deadline but more time could have been allotted to allow reconsideration of scenes and editing. Final version of When Penguins Fly (2018). This project made my love and respect for animated films deepen and also made me realize I would love to see more of my own ideas come to fruition in the near future. It made me realize that I would like to pursue being a multimedia artist. I was able to exercise my project management skills, especially towards the end where we needed to adapt quickly to problems. Learning how to use Maya and how to properly and efficiently rig, animate, and texture models will be a continuous learning experience for me, but this project gave me a taste of my goals for the future.